While Fatah head Abbas talks to Israel, Fatah’s armed wing declares war over Jewish visits to the Temple Mount. While Fatah head and Palestinian Authority Chairman Mahmoud Abbas negotiates with Israel for the creation of a PA state, Fatah’s armed branch, the Al-Aqsa Martyrs’ Brigade, has declared war. The Brigade issued a statement Tuesday announcing that it would give the “green light” to terrorist attacks targeting Israelis beginning on Friday. Tensions have been high on the Temple Mount in recent weeks, with many Jewish visitors to the holy site reporting harassment and violence at the hands of groups of Muslims. 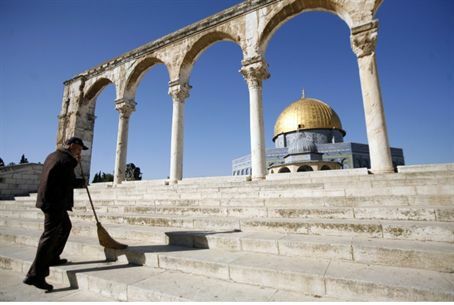 The Temple Mount is the holiest place on earth according to Judaism. The site is currently run by the Muslim Wakf. Jews are allowed to visit only during limited hours, and are forbidden to pray on the Mount. Muslim leaders have denounced Jewish visits to the Temple Mount, which is also the site of the Al Aqsa Mosque, and have accused Israel and Jews of attempting to harm the mosque. PA leaders, including Abbas himself, have made similar claims, insisting that Jews have no ties to the holy site and that Israel is secretly plotting to replace the mosque with a Jewish Temple. Police responded to recent Muslim violence by closing the Temple Mount to Jews, a step commanders argued was necessary in order to keep the peace. The Al-Aqsa Martyrs’ Brigade was responsible for several mass-casualty terrorist attacks during the wave of “Second Intifada” attacks on Israel. Among the attacks which its terrorists committed were a shooting at a bat mitzvah – a traditional celebration for a 12-year-old Jewish girl – which left six people dead, a bombing in the Beit Yisrael neighborhood of Jerusalem targeting a group of women and children, which left 11 dead, 7 of them children, and a bombing at the Tel Aviv Central Bus Station that murdered 22.